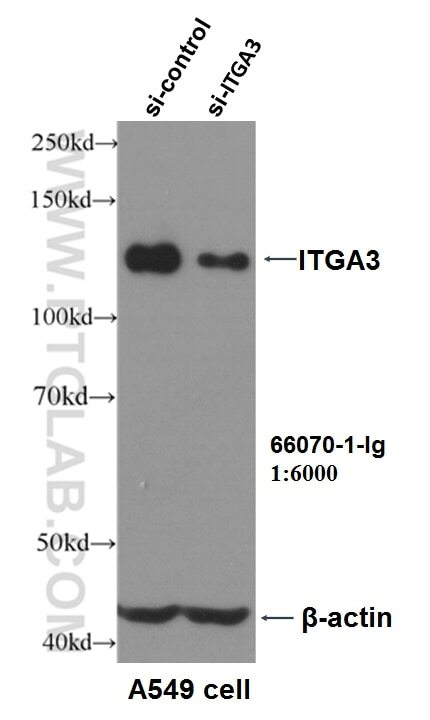 WB result of ITGA3 antibody (66070-1-Ig, 1:6000) with si-control and si-ITGA3 transfected A549 cells. 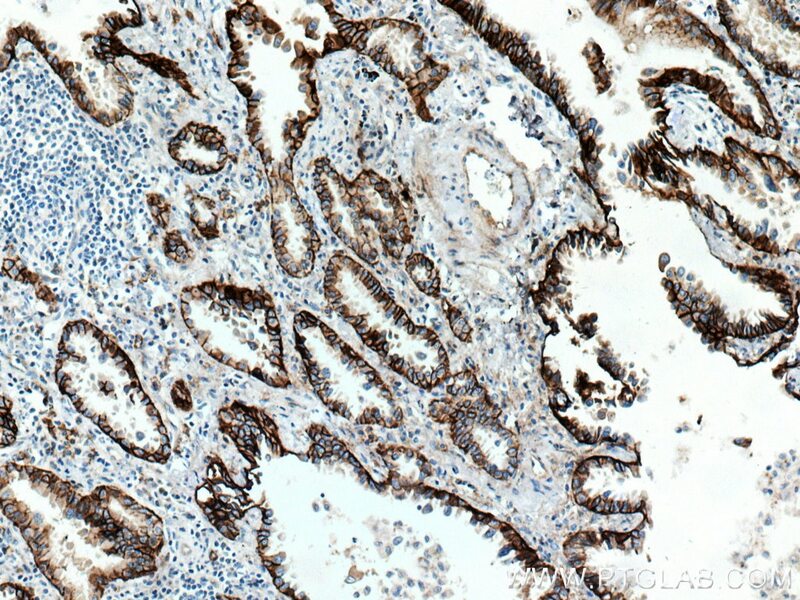 Immunohistochemical analysis of paraffin-embedded human lung cancer tissue slide using 66070-1-Ig (Integrin alpha-3 antibody) at dilution of 1:4000 (under 10x lens) heat mediated antigen retrieved with Tris-EDTA buffer(pH9). 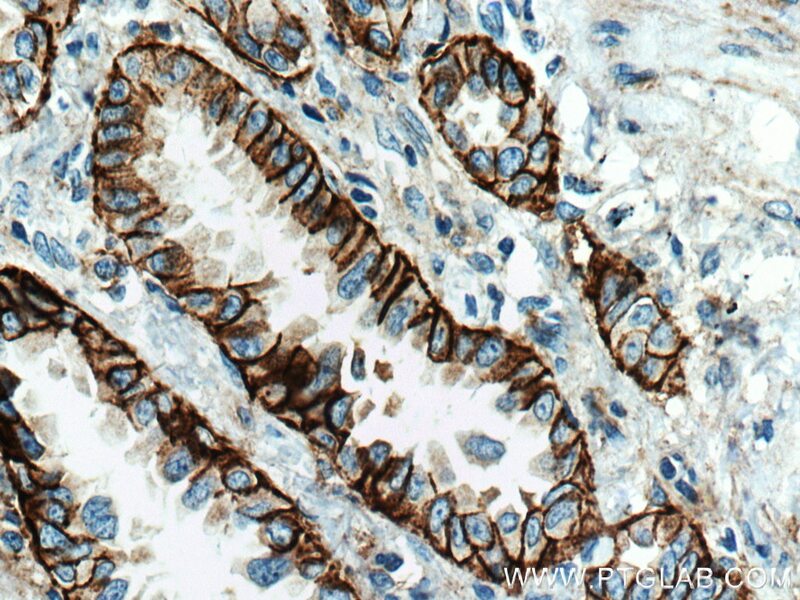 Immunohistochemical analysis of paraffin-embedded human lung cancer tissue slide using 66070-1-Ig (Integrin alpha-3 antibody) at dilution of 1:4000 (under 40x lens) heat mediated antigen retrieved with Tris-EDTA buffer(pH9). 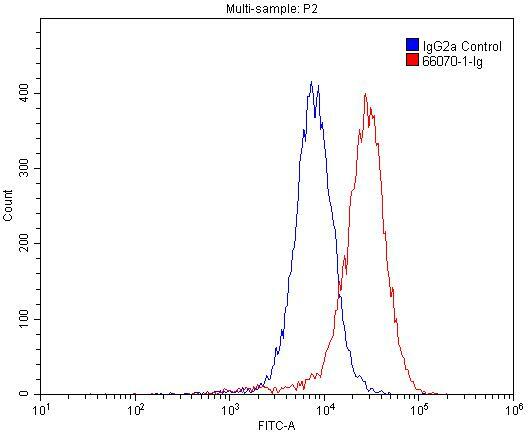 1X10^6 A549 cells were stained with 0.2ug Integrin alpha-3 antibody (66070-1-Ig, red) and control antibody (blue). Fixed with 4% PFA blocked with 3% BSA (30 min). Alexa Fluor 488-conjugated AffiniPure Goat Anti-Mouse IgG(H+L) with dilution 1:1500. ITGA3, also named as MSK18, CD49c, GAPB3 and FRP-2, belongs to the integrin alpha chain family. It is a receptor for fibronectin, laminin, collagen, epiligrin, thrombospondin and CSPG4. ITGA3 may mediate with LGALS3 the stimulation by CSPG4 of endothelial cells migration. ITGA3 is highly concentrated in epithelial cells where it strongly adheres to Laminin-5 and Laminin-5 induced rapid adhesion can be blocked by antibodies against the alpha-3 integrin subunit. It can be cleaved into heavy chain(840aa) and light chain(176aa). This antibody can recognize the heavy chain. Hypoxia-induced changes to integrin alpha 3 glycosylation facilitate invasion in epidermoid carcinoma cell line A431.